Kankung that you can easily pick-up by the roadside specifically along the monsoon drain was used as the comparison to explain the concept of supply and demand clearly reflects the desperation as well as the limited depth of his knowledge about economics. This begs the question is Najib capable to steer Malaysia from sinking further into the uncertain global economy. Obviously, he is not the man on the helm. However, anyone who replaces him may not be able to come up with a viable magic tricks either, be by the replacement Myuhiddin or Anwar. This is because the basic structure of the Malaysia economy is already destroyed ever since Mahathir introduces the New Development Policy (NDP) and the Vision 2020. Malaysia desires to be a developed Nation by 2020 but the basic structure of the economy was never changed. Soros showed Mahathir the weakness of our economic structure in 1997 but instead of learning from this lesson, which according to Mahathir “wipe-out” 40 years of “Nation Building”, Najib continues with his Transformation programs. Instead of focusing on strengthening the basic economic structure by providing ample employment to the people and concentrating on productivity whilst suppressing on the escalating cost of living. Najib’s Transformation, pick the corporate sector (both Public and Private) as his main vehicle of choice and instead concentrating on developing the Construction Sector. All his effort was doomed from the word go. His greatest mistake was he did not understand his father’s legacy, which in the 90’s was broken by Mahathir’s over-zealous attempt to parrot the Western development models of developing private capitals. The development model adopted by Maalaysia in the 60’s and 70’s was simply that “Malaysians must have employment,” job creation was critical. This is due to the influx of rural-urban migrations of mainly the Malay population, at that time was reaching a critical level of 3.3%. In order to create more jobs, low wages was the policy adopted. Vocational training was emphasized, Polytechnics were build and Technical Collages such as Kolej Tengku Abdul Rahman, Kolej Tun Abdul Razak and Institute Technology MARA was introduced. The government was even willing to forgo RM14 billion per year on “invisibles” as long as the people have jobs and have money to spend. As the people spend their money, indirectly, the money still goes back to the government. As the result of these policies, Malaysia became one of the emerging Tigers and Malaysia was set to become a Develop Nation at the pace, which was set in the 60’s and 70’s. Then our leader in the 1990 has wanted to accelerate the process and target the year 2020 as the year that Malaysia becomes a develop nation. No thoughts were spared to establish the foundation to achieve this Vision – the critical mass of innovative and creative human capital. This was because, in 1975 the longest serving Prime Minister, in his Nationalistic fervor made changes to our education systems which have consequences in the 90’s. The education system was geared towards creating a population, which conform instead of being innovative and creative. The absence of skilled human capital in Malaysia is the one obstacle which made the dream of a developed nation unreachable. This mistake only came to the fore in the 90’s when PUTRAJAYA and CYBERJAYA was created, Malaysia simply had insufficient innovative and creative workforce to take Malaysia to the next level. Instead of pulling back, take stock and reflect on the next course of action. Malaysia jumps into the bandwagon to increase the role of private sector and reduce public sector’s involvement in the development process. Once this process started there is no turning back, in 1997, the government has to bail outs numerous enterprises and public funds were used for these purpose which leave very little funds to build up the Country’s intrinsic strength – its productive population. The government needs fresh injection of funds and the amount coming in is trickling in because of declining consumer demand from Malaysia’s traditional markets such as Europe and the United States. The Malaysia economy cannot depend on its Export Industrialization Policy anymore, shifting from Industrialization to the Service Sector requires long transition period. There is just insufficient fund to manage the transition from Export Industrialization Industries to the Service Sector. The hard reality is that, the much forgotten Commodities in the 90’s that are now keeping the country afloat. Commodities however can only contribute so much to the economy; it has low employment value and most employed in the plantation sectors are foreign labors, which contribute further to foreign outflow of funds from Malaysia through remittance and Transfer Pricing. Unrestrained leakages, overspendings, and clueless prescriptions to the Malaysian Malaises are causing the situation today becoming worse. The country today have no choice, it has to exploit its other strength, which has never been discussed seriously at the center. Firstly, it has to open the Tourism potentials in Sabah and Sarawak, this entails the open skies policy into these areas must be allowed. Kuala Lumpur International Airport (KLIA) must stop hogging direct international flights into Malaysia. Direct international flights must be allowed into and out from Kucing and Kota Kinabalu. KLIA have no chance to compete with Singapore, Jakarta and Bangkok. Instead of being selfish, KLIA must think in terms of Kota Kinabalu and Kucing as part of its strength NOT competition. Managed properly, this will be part of its transition from industries to the Service Sector. Secondly, in the absence of demand for its consumer goods, Kuala Lumpur must look for alternative market elsewhere. Kuala Lumpur must start recognizing BIMP-EAGA as an important part of its economic recovery programs. The BIMP-EAGA has a market potential of about RM400 billion per year. The market size is substantial, but most important than this is that this market may well be the life line for Malaysia until such time the European and United States demand for consumer goods started to pick-up. Zainnal Ajamain is an economist by profession, graduating with a Masters degree from the University of East Anglia. He has held several high ranking civil service positions in government and government think tanks and has worked as a university lecturer, senior researcher, stockbroker, economist and published several papers in international media journals. He was the co-author behind the Sabah Government’s vision for development and progress in the Sabah Development Corridor and created the first Offshore Islamic Fund in Labuan. 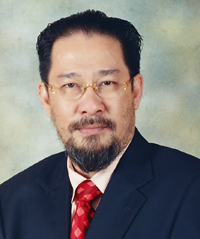 He also held the position of Senior Research Fellow in the Centre for Remote Sensing and Geographic Information Systems at the University Malaysia Sabah. He was the Co-Founder of the United Borneo Front (UBF) and a passionate activist to abolish the Cabotage Policy. He is also the Secretary General of a newly formed political party in Sabah.